It’s true! 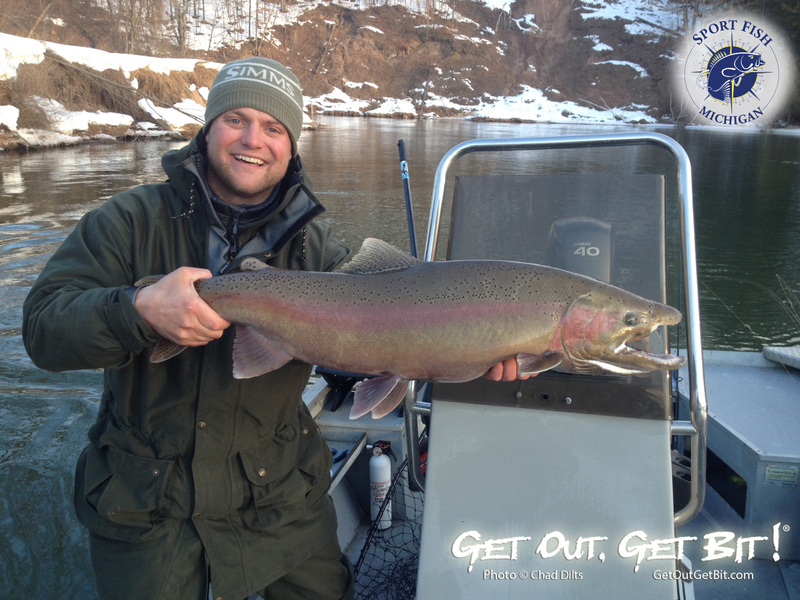 The recent warmer weather brought a small push of steelhead into the rivers, and this is just the beginning! The cold nights and warmer days are melting snow at a great pace to keep the rivers fishing well without flooding. Steelhead this year are running larger on average, thrilling anglers and our guide customers alike. Bobbers have been the better way to go so far this spring so far, but Backbouncing spawn along the bottom has produced great results as well. Word has gotten out that there are steelhead in rivers like the Big Manistee, and as a result, more and more anglers are showing up to take advantage of the angling opportunities. Coupled with the brutally cold weather the winter through at northern Michigan, soft water anglers are itching to get back on the water. Waters like the Manistee have anglers fishing up by Tippy Dam, for not only steelhead, but for the brown and rainbow trout that find their way up to the dam to take advantage of the food supply that clusters close to the dam. Anglers have found fish downriver at Highbridge, Bear Creek and even Rainbow Bend. With fish spreading out throughout the river, this bodes well to spread out the angling pressure as well. Smaller rivers northward haven’t seen as many fish returning yet, but with as much ice as there is still on the lakes, and even on Lake Michigan, the run is just in its beginning stages. It may be cold out there, but big Steelhead are biting in the rivers! River fishing on the Lake Michigan tributaries has been decent for steelhead, but far from stellar. The run is just beginning in earnest on the smaller rivers that host a run of steelhead. Larger rivers like the Big Manistee have better numbers of fresh steelhead, with the bulk of the run still yet to come. The size of the steelhead this year is impressive, and anglers targeting these powerful fish will be pleased with their catches, even if numbers overall aren’t high. A recent trip out saw a near 18 pounder come to net for a few photos with an ecstatic customer before happily swimming away after release. The slow thaw has many anglers breathing a sigh of relief, with water levels slowly rising, as opposed to the quick thaw and flood stage scenario that many feared. This is setting up for another great spring of steelhead fishing, that will likely last into late April as it did last year. Planter brown trout have also been caught recently, mostly on spawn. River waters are still very cold, with ice chunks banging into fishing lines. As we look forward to the remainder of spring, expect a great push of steelhead into the Lake Michigan tributaries. While light lines are the norm for steelhead, they seem to be running large and angry, so a slight beefing up in line size might not be a bad thing. River Report: The Big Manistee is starting to loosen up some of its icy grip, and this has both anglers and steelhead moving about. A recent trip saw several nice adult steelhead come boat side, including some bright fresh fish. Several nice brown trout were also caught, mixed in with some skipper steelhead. With the gradual warmup, the snow and ice is melting at a nice pace, without blowing out the river, as was the concern with all of the snow we’ve had this winter. The sun is out, the temperatures are warming, and spirits are high. There is a little stain to the water, with the snow and ice melt, but visibility is near perfect for good steelhead conditions on the Manistee. Other area rivers are beginning to thaw out as well, and anglers are starting to see some decent steelhead action on those rivers as well.